This post brought to you by Walmart, although I actually purchased the Bella® Linea slow cooker featured in this post with my own money. It was not provided to me for this post but I liked the features so much that I bought one. All opinions are 100% mine. I LOVE slow cookers. When you are a busy mom and never home in time to make dinner, slow cookers are a life saver. The ability to take a slab of semi-frozen chops out of the freezer, add a few additional ingredients and then come home to dinner is phenomenal! I have posted multiple slow cooker recipes here including soups and entrees, and I am a huge fan of pork in the slow cooker. It gets so tender and juicy when roasted at low temperatures for a long time, a result that is hard to duplicate in the oven. Today’s recipe is no exception. I was delighted with how well this came out. The meat was so soft and tender which a hint of garlic and ginger along with sweet and salty notes. recipe doubles without any trouble. In the past I have always had to make larger recipes because I used a big 7 quart slow cooker with very limited functionality. It got the job done, but it required me to scale up the recipe or add additional liquid so my recipe wouldn’t dry out. 1. It was fully programable (with both high and low settings), it defaults to ‘warm’ when the timer goes off which is great if you aren’t sure exactly when you want to eat. Plus it actually counts down on the clock on the outside so you know how much time is left. I had no idea how much time was left on my old one. 3. It is DISHWASHER SAFE (the insert obviously)!! My old stone insert was not. That sucker would sit in the sink for days.. I am so excited to just throw the big pot in the dishwasher! Now that we have our slow cooker picked out, it is time to COOK!! It grates so nicely (it doesn’t get all stringy like when it is room temperature) and when you have enough, just pop the rest of it back into the freezer until you need it again. Once you have all your ingredients, place your chops in the bottom of your slow cooker. 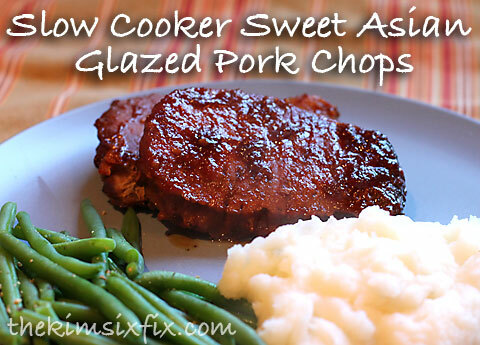 You can add salt and pepper to the chops if you wish. I didn’t because the soy sauce was already salty. Alternatively you could just cook on low for 6-8 hours if you have more time. I served them with mashed potatoes and green beans, although they would be FABULOUS over rice with some steamed veggies. They do have an Asian flavor. I thought they were fabulous, and I can't wait to see what else I can whip up with my new slow cooker. I'm going and it's my 1st conference. Would love to connect and get a scoop on what I should do before the conference starts! Cool! I"ll definitely find you on Twitter!